London psychedelic afro-punks Sabatta have released a video for their new single Scream Of Consciousness, exclusively with Louder. 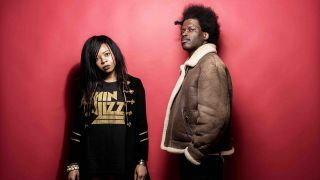 The single is the first to be released from Sabatta's upcoming second album, Misfit Music, which is due for release on 4 June. Frontman Yinka Oyewole tells Louder of the single: "A clear play on the expression 'a stream of consciousness', Scream Of Consciousness was a song that actually came to me as a flow of thoughts, feelings and words. "Essentially, it’s an expression of the feeling of getting caught up in a swirl of the whirlpool that is a modern day city. In the rush, it’s often hard to make out the sound of a single voice. So that voice can turn into a scream, and then you realise that cacophony of noise you’re hearing – that torrent of sound – is actually the screams, shouts, cries and whispers of the whole city. "For the video, the first thought that came to my mind was of the Edvard Munch painting The Scream, ironically, despite it not being an inspiration for the song. I initially wanted us to film on a bridge and shoot it there, but then thought the song is about the city, so let’s go out and shoot in different parts of London. "Where I live in Elephant And Castle, there are some huge billboards near what was the main roundabout, and I decided it might be cool to have one of us on the billboard Blade Runner style. It’s quite dystopian, but that’s kind of the world we live in. To wrap up the concept, it’s almost as if bassist Debbie Dee's appearance on the billboards is my conscience." Misfit Music will be released on 4 June 2018 via Blackfriars Entertainment.